Love is in the air at Melrose Arch! We’re celebrating the most romantic month of the year by giving away amazing prizes every week, starting today to Thursday, 28 February. One lucky person can win a prize package that includes restaurant, spa and jewellery vouchers, chocolate and, during the last week, a stay at a luxury hotel. Experience Melrose Arch in a way like never before! Winning is easy. 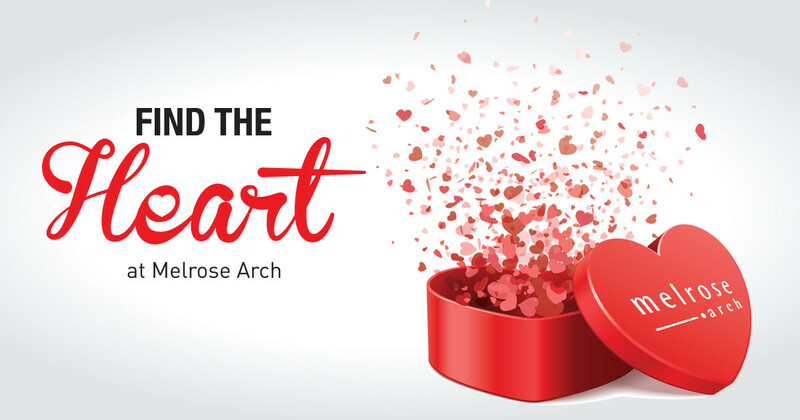 Simply find the heart at Melrose Arch, take a selfie and share it in the Comments section on this post. (Hint: Don’t forget to admire the spectacular supercar from Daytona while you’re there.) Draws will take place on 15 February, 22 February and 1 March and the winner of each draw will take home a prize package comprising: •	A R1 000 voucher from Camelot Spa •	Two double tickets to the Goliath Comedy Club •	A R1 000 voucher from Häagen-Dazs •	A R1 000 voucher from Jade Jewellery •	A R1 000 voucher from Moyo •	A R1 000 voucher from Piza ? Vino •	A R500 voucher from Sorbet •	A R100 voucher from Starbucks •	A R1 000 voucher from The Grillhouse •	A hamper from The Melrose Arch Flower Market containing chocolates and other delectable goodies, valued at R500. In addition, the winner of the final draw on 1 March will win a one-night stay for two at the five-star African Pride Melrose Arch, Autograph Collection hotel.